In our opinion, there are better alternatives for those who like to do their own troubleshooting. Whether you are a repair shop a Mercedes-Benz owner consider these scanners as well. Note that we do not endorse any of the following OBD II / CAN scanner brands. Links to OBD2TOOL and eBay listing are provided if you need to check current prices. 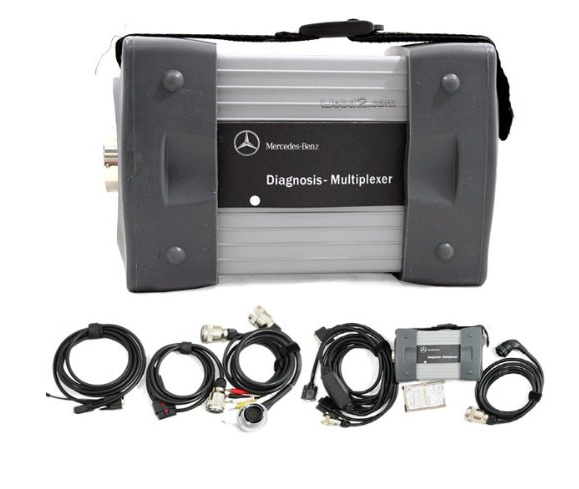 Carsoft 7.4 multiplexer: This is a much less expensive scanner than Mercedes Star Diagnostic C3 or C4. While it does require a laptop to run, using the carsoft 7.4 is much easier than using the Xentry software. One other advantage of this scanner is that it comes with several cables such as the 38 pin connector for the older models. It has a good coverage of models such including the popular models such as E-Class, C-Class, S-Class, CLK-Class, GL-Class, G-Class and more. The main disadvantage of this scanner that while it can read and erase fault codes it can not perform programming. What can I do with Star Diagnostic SD Connect Scanner C3 & C4?